If you want to install or update security components, you can do so as a separate task. In the console, click Tools > Configuration > Agent Settings. 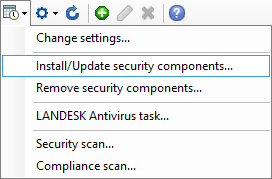 Click the Create a task toolbar button, and then click Install/Update security components. 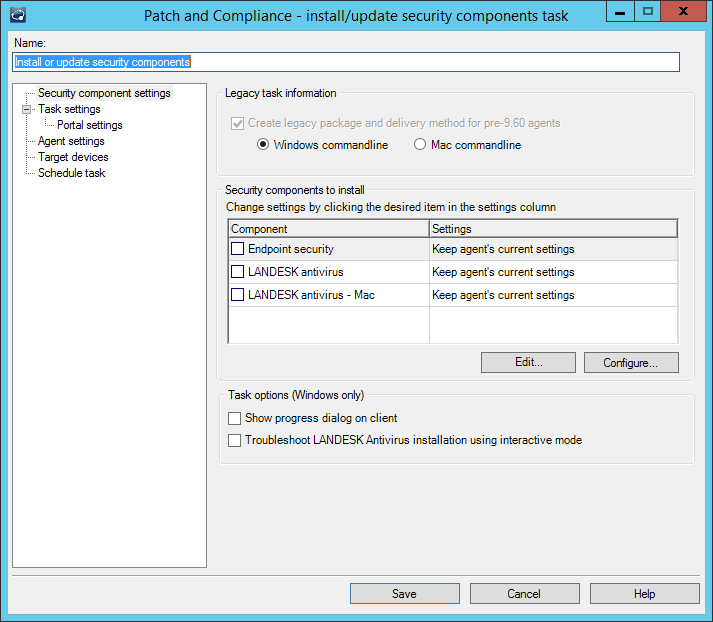 The Install/Update security components task dialog box appears. Select the component you want to install. You can create new settings or edit existing settings by clicking Configure. If you want to display the installation progress in the security scanner dialog on targeted devices, select the Show progress dialog on client option. Select a Scan and repair setting from the list to apply its reboot configuration (only) to the agent configuration you're creating. You can create new settings or edit existing settings by clicking Configure. Keep in mind that only the reboot options specified on the Scan and repair settings you select are used by this agent configuration's Endpoint Security agent deployment to target devices. You can use existing Scan and repair settings that already includes the reboot configuration you want, or you can create brand new Scan and repair settings specifically for your agent deployment. You can configure the task targeting and scheduling options now on the rest of the dialog box pages, or you can click Save and do it later in the Scheduled tasks window.